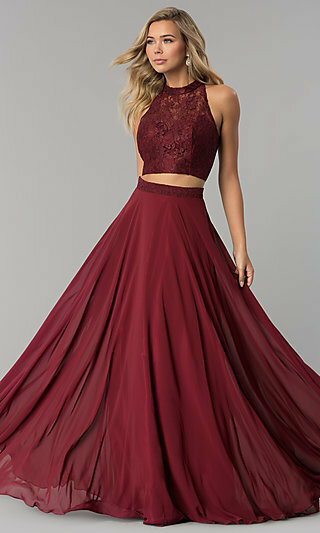 This collection of two-piece prom, pageant and homecoming dresses includes some of the hottest trends for when you want to stand out from the crowd at your special event. These two-piece short party dresses and long gowns offer a classy sophisticated style with a touch of rock star glitz and glam mixed in. Where Can I Find the Best Two-Piece Dresses? You will find long and short two-piece dress styles for every season and budget. There are glamorous two-piece evening gowns for your pageant or prom, from some of the best known designers. 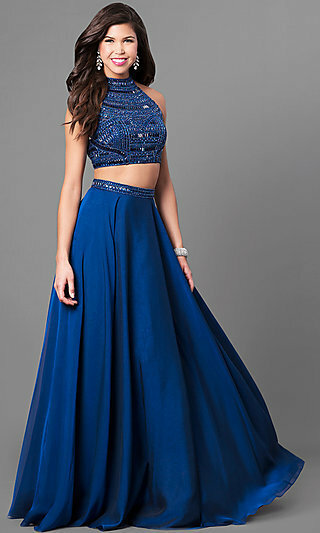 Chic and unique two-piece beaded long halter dresses, dresses with sleeves, and playful prom gowns with sequins or polka dots are available at PromGirl. Looking for a two-piece dress with a more youthful design for your junior prom or sweet sixteen celebration? The party will start the moment you arrive in one of these super cute two-piece lace bodice or two-piece crop top dresses or sheer open back prom dresses. With a little peek of skin at the midriff, these two-piece short dresses and two-piece floor length dresses will flatter your figure and make you look like you just stepped off the runway at New York’s Fashion Week. 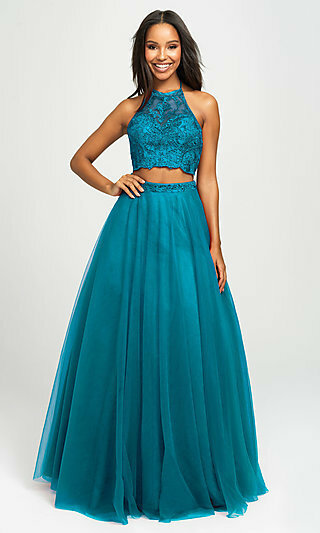 Why not rock your special event with a dress from PromGirl’s collection of dazzling designer two-piece dresses that are priced to fit any budget. Many of these two-piece dresses are in stock and ready to ship.